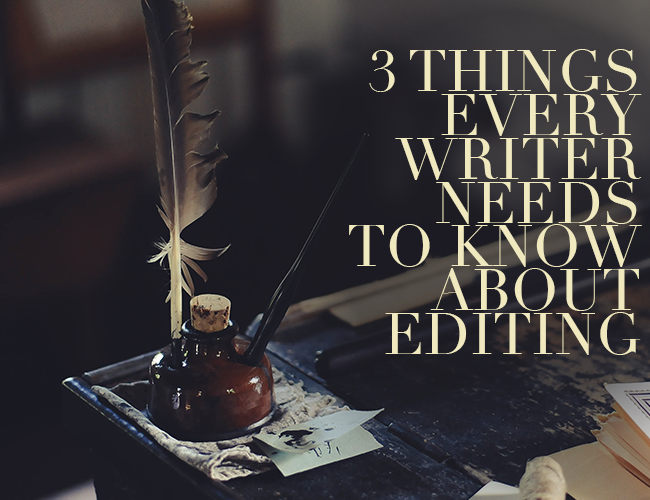 In the short time that I’ve been a writer, I’ve learned a valuable secret that we writers don’t discuss often: a writer is only as good as his or her editors. Receiving feedback and accepting criticism and edits isn’t easy. No one likes being told what they are doing wrong, especially when the thing being criticized is something we’ve poured our heart and soul into it. It took me a year to finish my first book. When it was done, I treated it like a family member. I was part of a writing group at the time. I remember presenting the story to them with pride, expecting Ooo’s and Aaah’s. Instead, they cut it to shreds. They sliced and diced. Nothing was left untouched. Of course, before my writing group said anything, I knew most my story’s flaws. I knew how terribly the plot flowed, how poorly many of the scenes were constructed, and how the protagonist was flat, unchanging, and passive. I knew. But I was treating my story like crazy Uncle Joey at the family picnic. Other family members can comment on how crazy Uncle Joey is, but if an outsider does it, watch out! Those are fighting words. I took the edits personally. A finished story can feel like part of us, as if we had created a new appendage that is now at work with our arms. We tend to call our stories “our babies” and we say we “give birth to them.” I think this is because creative work is intimate. When we write, we expose things about ourselves on the page. As writers, it is necessary that we separate ourselves from our work. While it does reveal aspects of who we are, it is not who we are. We must learn that when people criticize it, they are not commenting on us as individuals. If we can’t separate our work from ourselves, then we will miss opportunities to grow. Remember, a critique of your writing isn’t a critique of YOU as a person. 2. Every note is a good note. There was one time when I gave a speech to a room of a few hundred people. A week after the talk, I got a card in the mail. It was in a decorative envelope and had butterflies on the front. On the inside of the card, in tiny handwriting, were paragraphs and paragraphs of criticisms. The author of the note thought I’d talked to fast, I’d misinterpreted the text I was reading from, and my illustrations distracted from the seriousness of the topic. He even criticized things like the belt I’d chosen to wear and how I moved around the stage as I spoke. It was easy to be offended by the note. At first I wanted to rip it up and throw it in the garbage; but, instead, I tacked it to my wall. Each morning for a week, I came back to it. Taking one criticism at a time, I tried to imagine the critic’s perspective and understand why he saw what he saw. While I found I disagreed with the vast majority of his points, I learned a lot about how I my talk was perceived by audience members, and how my style could be changed to avoid those perceptions in the future. When we receive notes on our work, we must try to take them with an attitude of gratitude. The fact that someone has taken the time to read our writing and was moved to share his or her opinion is a compliment (even when the opinion is not). Receiving feedback and approaching edits in this way opens us up to learn from them. If we can be thankful for them, then even the most bizarre and odd notes can become learning tools. When someone takes time to give you feedback, it’s a compliment (even if you disagree with them). I’m not saying you need to accept every note at face value. Recently I published a story online and a commenter said, “I saw the ending coming a mile away.” This note was helpful, just not in the way the commenter had intended. Through the story, I’d been leaving clues as to how the story would end. For me, the story was less about the thrill of the journey and more a commentary on the background of the story. By hinting to the ending throughout, I’d hoped to enhance the point that an ending to story about social class only ends one way. I took this note, therefore, as a compliment. That the reader saw the ending coming a mile away was a good thing. Unfortunately, I also took away from this comment (and other comments on the story) that maybe my social commentary hadn’t been as clear as I’d hoped. None of the commenters mentioned it. I am grateful for all these comments because they helped me see my piece in a new way. 3. Diversity in editors is good. The best edits I’ve ever received came from a woman in Asia who is twenty years my senior. She saw problems in my writing that I was blind to because of my cultural upbringing. Things I assumed everyone thought she showed me were unique to me. I ask her for notes now whenever I can because I know she will see my stories differently than I do. We live in an amazing time. Never before have people across the globe been so connected. Through the magic of the internet, even though I am located on the east coast of the United States, I can receive notes on my work from European writers, and Asian writers, and African writers. We are so lucky. I therefore feel that, because we live at such an incredible time, it is upon us to pursue notes from cultures different than ours. We must work to find readers who will provide us with different perspectives on our work. Not to do so would be to squander the amazing blessing of connectedness. Receiving feedback can be hard. It is never fun to be told what you are doing wrong. At the same time, if we want to produce our best work, then we must put our personal attachment to our work aside, not take edits personally, pursue editors who come from a different world than we do, receive their edits with an attitude of gratitude, and learn from them. We will be better writers for it. Do you have any tips for receiving feedback without feeling stung by it? What’s the best (or worst!) feedback you’ve ever received? Let us know in the comments. A former assassin is haunted by a ghost. When you’re done, share your work in the comments. Then, offer notes to someone else’s work. The goal is to accept and receive feedback, so don’t hold back—tell your fellow writers something that works, an area where they can improve, and another great thing about their writing. Finally, when your own work receives an edit, say “thank you.” Remember, it’s a compliment for someone to give you feedback, even if you disagree with their comments.